Remove a block of cream cheese from the fridge and let it get a little soft, but not goopy. Fill a dish with a good sized lip on it with lots of sesame seeds. Press each side of the cream cheese into the seeds so that they really stick into the cheese. 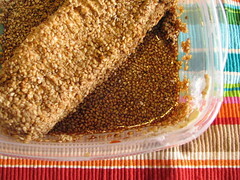 Set the cream cheese on top of the remaining sesame seeds. Pour liberal amounts of soy sauce on top of the cheese. you want enough sauce to accumulate in the dish to touch the bottom of the cheese, but not so much that the seeds float off the sides. Place the dish in the fridge and turn the cheese a couple times. sprinkle more sesame seeds on top. We served it last night and it was entirely consumed. People liked it a lot, though some people were unsure at first what the heck it really was. (And we didn’t know what to call it.) The recipe has a vintage vibe, but it’s pretty darn tasty to the modern palate, as well as being simple and not requiring any actual, you know, cooking. Thanks for the recipe, Elizabeth! Here are a couple of variants to this recipe I found online: Cream Cheese Pickled in Soy Sauce, and Toasted Sesame Cheese Spread. With luck I’ll have a stove again soon and I can get to work on the Malted Milk Cake.